Are you someone with a product-based business? Or perhaps you do overhead video tutorials for DIY topics such as cooking, cake-decorating, jewelry making, slime squishing? Yes, slime squishing is totally a thing on Instagram and it’s pretty addicting to watch! If you want some killer engagement, apparently start making slime videos. 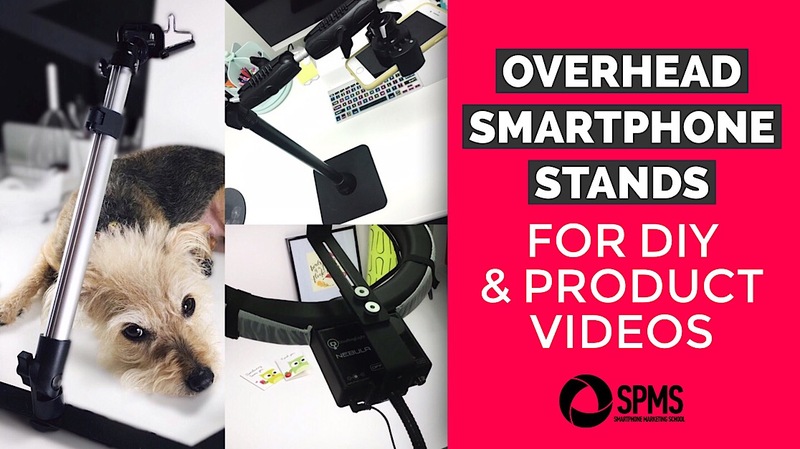 Anyways, if you answered yes to any of those questions above, you’re most likely searching for the best type of overhead smartphone stand to help you produce quality videos from above. 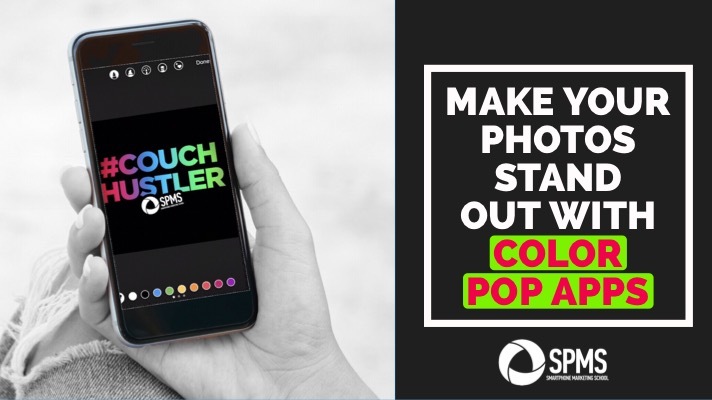 And of course I say smartphone stand because you’re here at the Smartphone Marketing School blog – that’s what it’s all about! I myself have been on a long and Google-search-filled-quest to find the perfect overhead stand. Although I still haven’t found a one-size-fits-all perfect option, here are some stands I’ve used and highly recommend. Hopefully one will work for your specific needs and budget (and these are affiliate links because, hey, why not?) . If you have trouble with the legs of the stand getting in the way of your shot, just place a white foam board on top of them. That will double as a background for you as well. Keep in mind that this stand does NOT come with a smartphone mount attachment. That means you’ll need to purchase one separately. But if you’re serious about smartphone video, you’ll use this attachment all the time. 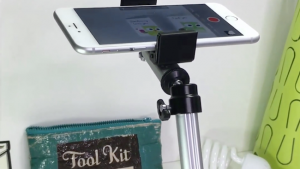 They work for attaching your smartphone to any type of camera stand. My favorite more expensive mount is the Square Jellyfish. It allows you to easily switch from portrait to landscape mode. 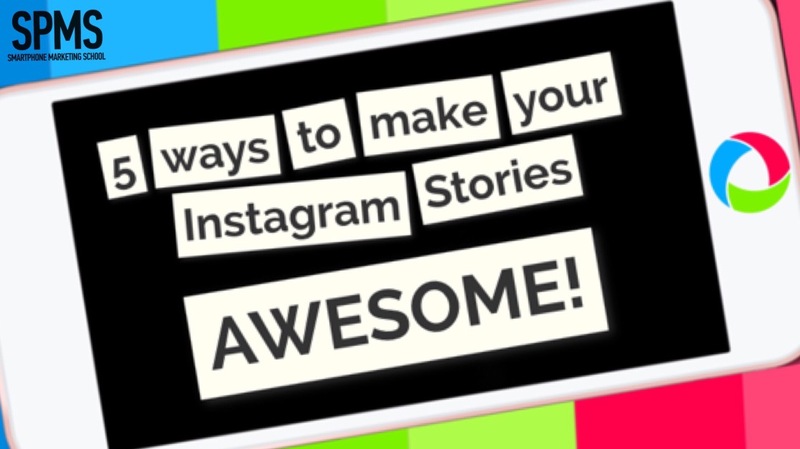 Vertical video has really hit the scene, whether it’s Stories, Live video, or even Pinterest. So I totally love this mount for that reason. However, you can definitely search on Amazon for cheaper ones. Ok, full disclosure. I have not yet bought this bad boy but as soon as I’m not traveling in an RV van, it’s the first thing on my list. 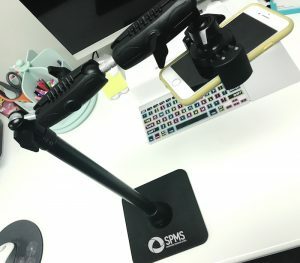 I did get to test the Arkon Pro Phone Stand out in person, thanks to my fabulous biz friend, Marisha McGrorty of SLP Now. It’s super sturdy and you get some incredible height on this stand (up to 29 inches). It also comes with its own smartphone attachment. One issue for me personally is that I video my phone, a small item. The lowest adjustment height is 17 inches, so I will have to either adjust the stand at an angle or put my phone on a box or some type of small platform (unless I can talk my husband into cutting it down). But I’m getting it for sure. Make sure if you get it as well (or any item from this company), that you use Tabitha for a 20% off discount. Ok, the Diva Ring Lights are definitely not cheap. 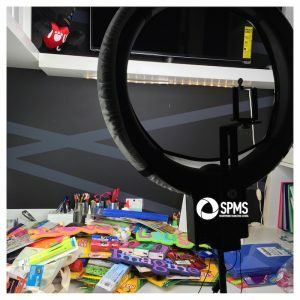 But if you’re also in the market for lighting, something lightweight and transportable, or a solution for talking video lighting and stability, then a quality ring light is pretty much perfect. I have the Nebula Diva ring light, but the SuperNova, which is a step down, works just as well. There are also cheaper generic brands out there, but I haven’t tried those personally. 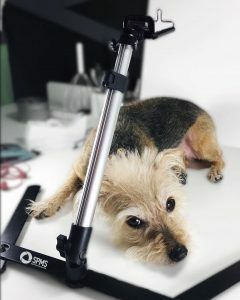 Make sure you buy a ring light with a bendable goose neck so you can bend it over a table or desk. Mine sometimes wants to tip when I do this, so I’ve attached 5 lb. weights to the legs with hair elastics (super high-tech, right??). The other issue I’ve had while videoing an iPhone screen is that you can often see the reflection of the ring light in the video. I have to work to get the angling right, but for items that don’t show glare when reflecting light, you should be fine. This option also requires a separate smartphone mount. So these are my options that I use or plan on using in the near future. 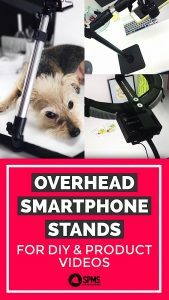 Do you have an overhead smartphone stand you love that I didn’t mention? Please, please, please let me know. Seriously. If you’d like to remember these smartphone stands later on, pin this image to your Pinterest account.